Summer has made a welcome return over the past few days, after a long spell of very unsettled stormy weather. We still have a lot of flowers blooming in the garden, but there are hints that the season is changing. Some of the plants, like these aquilegia, had their moment earlier in the year, and their flowers are already over. All over the garden there are reminders that August is nearing its end, and that autumn is just around the corner. Fruit is swelling and ripening, and many of the plants are now carrying seed heads. 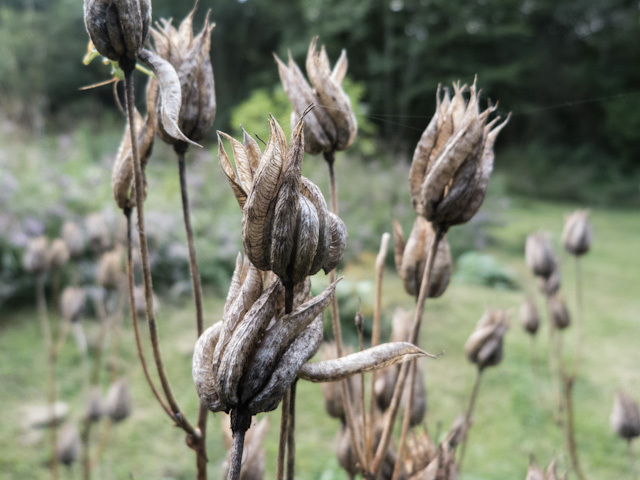 They give the garden a slightly melancholy air, which I quite like, and I find some of the seed heads every bit as beautiful as the flowers that preceded them. The shapes and textures are very inspiring in terms of my jewellery, and I have a number of designs which feature seed heads, in one form or another. I’ll gather the seed from some of the plants, like the honesty and aquilegia, to plant next year. The calendula should just self seed where it is, and the ‘weeds’ will no doubt do their own thing! I do enjoy the rhythm of the changing seasons, and early days of autumn are one of my favourite times of the year. For now, though, the sun is shining, and we still have plants like roses, geraniums, cornflowers and larkspur in flower, so I’m going to enjoy the rest of the summer while I can.